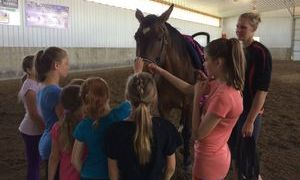 We offer a Recreational Vaulting Program for ages 5 and up. This Program is the entry level program for all vaulters at the club. As a Rec vaulter you will learn all the basics that apply to the sport of vaulting: basic horse care, basic gymnastics skills, rhythm, flexibility, strength and of course vaulting on both the barrels and horses! Vaulters will experience Individual, Pairs and Team vaulting skills in a safe and fun setting during weekly practices! Vaulters may choose to stay in the Rec program as long as they wish, or if they desire the competitive stream, we can work towards those goals as well! Sessions run twice per year: September-November and January-April. At the end of the session the vaulters will have the opportunity to show off their new skills and routines at our club showcase event - friends and family is invited to come out to support our vaulters! The Pre-Competitive Program is designed for the vaulters making the transition from the Recreational Program to the Competitive Program. Once vaulters demonstrate a high commitment and desire to reach higher goals in vaulting, they will be invited to try out for our Pre-Competitive Program. Vaulters will train twice per week and will be required to do extra work at home and/or attend additional cross-training programs. Vaulters will be invited to attend the club's Competitions and Events as well as Recognized Competitions in Alberta, and local performances. 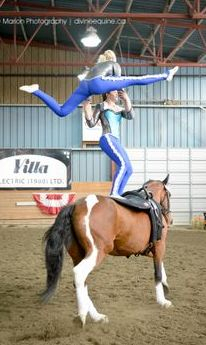 The Competitive Vaulting Program is aimed at vaulters with several years of previous vaulting experience. This Program will demand a higher level of commitment and is therefore only open to vaulters with interest in being highly competitive. Typically vaulters will progress from the Recreational program, through the Pre-Competitive program before joining the Competitive program. Both Individual, Pas De Deux and Squad training is offered at this level. The competitive vaulters train a minimum of twice per week and up to four times per week, and additional cross-straining will be required to supplement training at the club. Vaulters in this program compete at the Provincial, National and International level. You can find more information on each of our programs on this page!